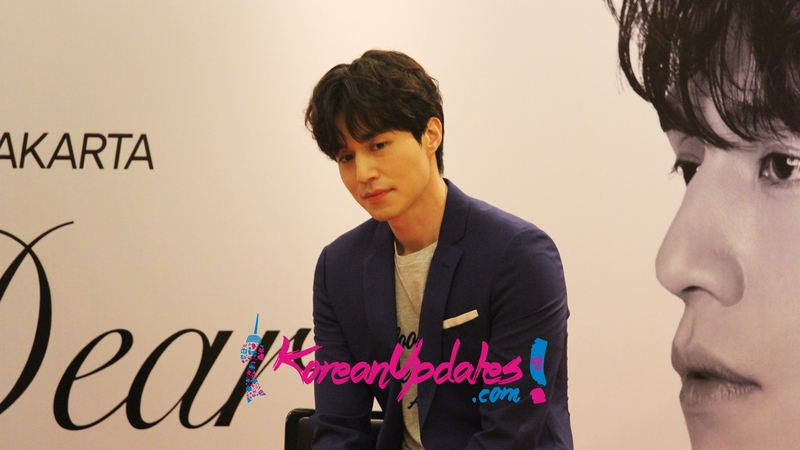 Last Friday (05/19) Koreanupdates was given an opportunity to interview Lee Dong Wook during his Lee Dong Wook For My Dear in Jakarta. You have experiences other than acting. If you could choose any other career apart from actor, what do you think it would be? LDW: Nothing. there is no other skill other than acting. that is why I am working hard to improve in acting. But sometimes I wonder if I could sing well, hold a concert, I also imagined that I could sing in front of audiences. but I can’t do that so this will remain as dream, won’t it? Have you ever imagined yourself not being an actor? What kind of life do you think you have if you never became an actor? LDW: I think I would live as an ordinary man. I debuted when I was in 3rd year of high school. When I became an adult I continue to live just like now. I wanted to be a Korean language teacher back when I was in school. Maybe I could be a Korean language teacher, or if I wasn’t an actor, maybe I already got married now. I would live as an ordinary man. You have been celebrity for almost half of your life, do you miss anything from being an ordinary person? LDW: Specifically there is nothing that I envy. But I can’t really go to any crowded place. I can’t get a normal life in university. But those are things that I have to sacrifice to be an actor. As the replacement, I can get love and support from all fans in return. I think it should be like that. If we talk about daily life, what is your favorite activity during your leisure time without any project? LDW: I don’t do anything. House is the best place when you’re doing nothing, right? I just sleep and do normal things. I exercise every morning. I do weightlifting every morning. every time I arrived home I do the household works for example cleaning, cooking and at night I watch news and baseball competition on TV because baseball already in its season in Korea. If I have appointment with friends, I will go to meet my friends. I live ordinarily. If you could come back to anytime or any project, is there anything that you regret or maybe you want to fix it? LDW: If we come back and talk about My Girl era, i really didn’t know anything. I did the main cast role for the first time in My Girl. I received a huge love from fans (at that time), but I didn’t really know if it was a hit or not, if it was good or not, I couldn’t get the feeling. If I could know these things at that time, wondering if I would have acted better at that time or maybe I would receive a better love at that time. But now when I do activities for Goblin I received so many love from fans. Thanks to it I can be here to hold a fan meeting here. I want to think this kind of moment as a good one, I want to keep it just like this. Love from fans is important to me.